Music history tends to be viewed through the genius lens. Things clomp along, then some supernaturally talented man or woman jumps into the spotlight and pushes the whole thing into the future. There’s some truth to that perspective to be sure, but the problem is that it doesn’t account for the musicians who manage to shine brilliantly from the shadows. 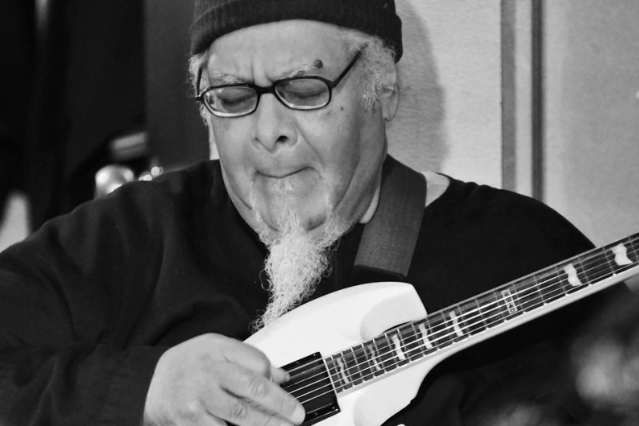 Chicago guitarist Pete Cosey, best known for his work with Miles Davis, is one of those unsung heroes. He passed away this morning at age 68. The causes are as yet unclear. If you at all give a cus about mind-melting guitar, you need to get acquainted with Cosey’s playing. On early and mid-’70s Davis albums like Pangaea and Agharta, he plays with otherworldly intensity, his screaming, saturated tone slicing through the primordially funky throbbing grooves that his boss was exploring during that time. Sometimes it sounds as if Cosey is playing nine notes at once, but not in a speed-demon way — more like all the notes in the universe are in the air, rushing towards him, and he’s grabbing what he can. Now and then he blurts out this squalls like he’s completely overwhelmed by the rhythmic and harmonic possibilities. So he just blows the whole thing up. It really is incredible. Before Cosey, a thoughtful man who just sort of drifted from view over time, got way out, he got deep down low, playing on Muddy Waters’ 1968 psychedelic Electric Mud album and Howlin’ Wolf’s even wilder The Howlin’ Wolf album from the following year. Purists at the time, the Wolf included, thought the oozing, slashing electric guitar, much of it Cosey’s, was a sell-out. Maybe it was. But it was also as adventurous and earthy as late-’60s blues guitar got. Both albums have gained in stature over time, which is fitting, because Cosey’s playing sounded like the future. And it always will. The solo starts at 4:39.